The Atlanta Hawks are up for sale with the owner of the club stating he is selling off his controlling interest. This is down to the fact that he made remarks that have been deemed to be racially insensitive. 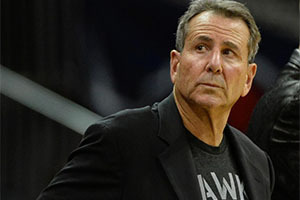 Bruce Levenson stated that the email he sent two years ago has given fans every right to be angry and in the current climate, he is looking to sell up and move on. The email centred on the poor attendances at the Hawks games and the need to bring more attendees to the games. Unfortunately, a number of remarks and ideas made by Levenson were based on racial profiling and the language or ideas cited can be construed as being questionable. Clearly the NBA has to be sensitive with respect to racial issues, especially in the wake of the Donald Sterling incidents from earlier on this year. This was only four months ago and the commissioner of the NBA, Adam Silver, took the unprecedented move of banning the owner from the league while also fining him $2.5 for the racist remarks that he had made. Sterling had been recorded advising a female friend of his not to be friendly with or associate with black people. The Clippers story was eventually concluded in August when Steve Ballmer, bought the franchise for more than $2bn. Ballmer is a former CEO of Microsoft. By focusing on race, I also sent the unintentional and hurtful message that our white fans are more valuable than our black fans. I have said repeatedly that the NBA should have zero tolerance for racism, and I strongly believe that to be true. That is why I voluntarily reported my inappropriate e-mail to the NBA. The fact that he reported the email himself will undoubtedly have a few people questioning his motives. Was Levenson perhaps looking for a way out of the ownership of the club and this has given him an easy solution? Was he perhaps fearful of the email being leaked at a later date, and leaving him not in control of the story. Perhaps he felt that by making the issue public himself and making the first move he wouldn’t be subjected to the sort of public pillory that Sterling rightly deserved. There is no doubt that the Hawks do have an issue with bringing fans to their games. It is well known in NBA circles that for many games, the support for the away team will be as strong if not stronger for the opponents of the Hawks than it is for the home team. Atlanta provides a great chance for fans and ex-patriots of so many of the other teams of the NBA to see their team in action and if the locals are turning out to support their local team, opposition support will always seem stronger. Given that the NBA is continuing to work hard to remove any aspect of racism in the sport, this will be seen as another positive step for the organisation and a sign that progress is being made. There is no doubt that there will be a big knock on for basketball in Atlanta but with the NBA continuing to make progress in this field, hopefully the whole game will benefit. There is no doubt that the Atlanta Hawks need something fresh and interesting to draw a greater crowd and perhaps it will come in the aftermath of these events.